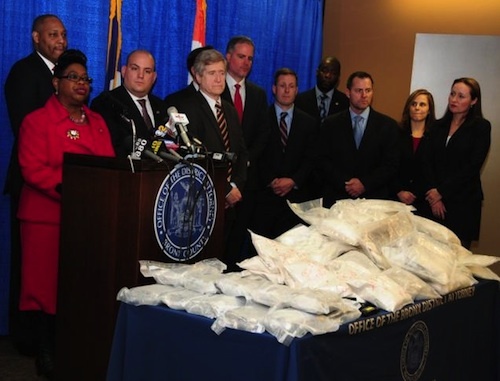 Last week authorities busted a major international drug ring operated by Bronx drug dealers who employed long-haul truckers to transport heroin and fentanyl from Honduras and Mexico to Los Angeles, and then to New York. Prosecutors say the drugs were hidden in trucks carrying legitimate cargo. So far, 32 people have been arrested for their various roles in the operation. The investigation, “Operation Open Market,” began last February when the NYPD's Bronx Gang Squad began cracking down on what they thought was a smaller scale street crack ring in the borough's Concourse neighborhood. According to the Bronx’s DA Office, investigators quickly discovered that two brothers were in charge of the operation and it was much bigger than they originally thought. They uncovered a major trafficking network involving heroin, fentanyl and cocaine, and discovered that customers were coming from Pennsylvania, Massachusetts and other states to purchase the drugs. The dominos began to fall when authorities began arresting people after they picked up drugs from the Bronx neighborhood location. While brothers Steven and Daniel Rivera allegedly ran the ring, investigators also allege that Jason Alvarez supplied it and conducted negotiations operating from his family’s neighborhood restaurant. Alvarez is also accused of being the person who arranged to have truck drivers transport the drugs from Honduras to the east coast. 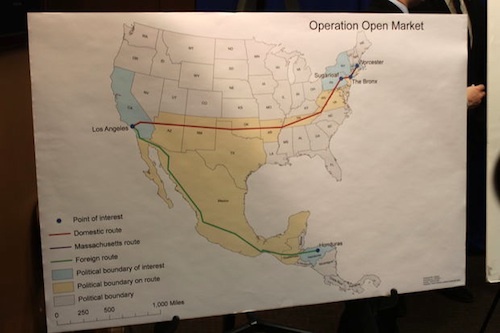 “The heroin and fentanyl would originate in Honduras and then travel through Mexico to Los Angeles, at which point different truck drivers would pick it up and take it to the New York area in tractor-trailers also carrying legal cargo,” officials said. After arresting a defendant in late December, carrying a kilogram of fentanyl, investigators then learned that two truck drivers would be picking up shipments in mid-January in Los Angeles. When one of the trucks arrived at the Bronx location days later, officers found 10 kilos of heroin in a wheel well and that led to the investigation's "finale" crackdown. NYPD and DEA officers began carrying out search warrants, arresting a total of 32 people and confiscating more than $50,000 in cash and three Mercedes Benz vehicles in the process. Bronx District Attorney, Darcel Clark, says that in 2015, the Bronx had the highest rate of deaths from heroin overdoses throughout New York City and she has heard countless stories from people who have been directly affected by the increasing epidemic. "I've been to every community board and many other neighborhood associations, and no matter what age or socioeconomic, racial or ethnic background of the residents, whether they live in private homes or public housing, they tell me of a relative or friend that they lost to overdosing on heroin and other opioids," she said. Drivers no longer allowed on docks . . . Sealed trailers . . . Drop and hook operations . . . But yeah, hang the driver. It seems they are treating the drivers as small players in this one...they caught the big fish. Some as I never knew what I was hauling, it's against the Company for me to bust a lock !! Wow - certainly much worse if drivers are put in that position and taking that risk unknowingly! I never like the idea that you couldn't check out the load.Everything, always locked up,I'm sure DEA & most law enforcement understand that,just a headache we don't deserve. a huge headache that truck drivers don't deserve! Trucking Unlimited or even worse who's to say a remotely activated bomb loaded up and on its way to LA? Glad you listened to your gut, not worth getting caught or roped into those rings! It's up to $12,000 a head at times, depending on the situation. I thought I was moving drugs. Car parts 200 miles one little box? Sounds like a very big problem for u truckers! If you pick up a sealed trailer ! And the seal number is on the bills !! And has not been touched then you could not be held liable ! You would probably get arrested at first so they could check out your story and background ! But then you would be let go ! You can not be charged for something you did not but know about or had no involvement in the loading of the products ! Do you mean Bellevue ?? Where I live?? Wow crazy what's the name on the side?? Blame the shippers and receivers, not the drivers. Look Trumps wall is the answer....hahaha!!!! Truckers are always the Blame for any !! Is there a link for an application?